We manufacturing a range of pressure vessels that cater to the needs of worldwide clients. 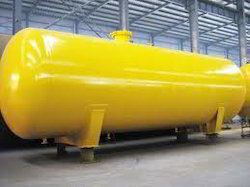 A Ammonia Pressure Vessels is defined as a closed container designed to hold gases or liquids at a pressure level different from the existing pressure. Sturdily constructed using finest grade material, our range of vessels are precise in construction, high in performance and have better durability standards.